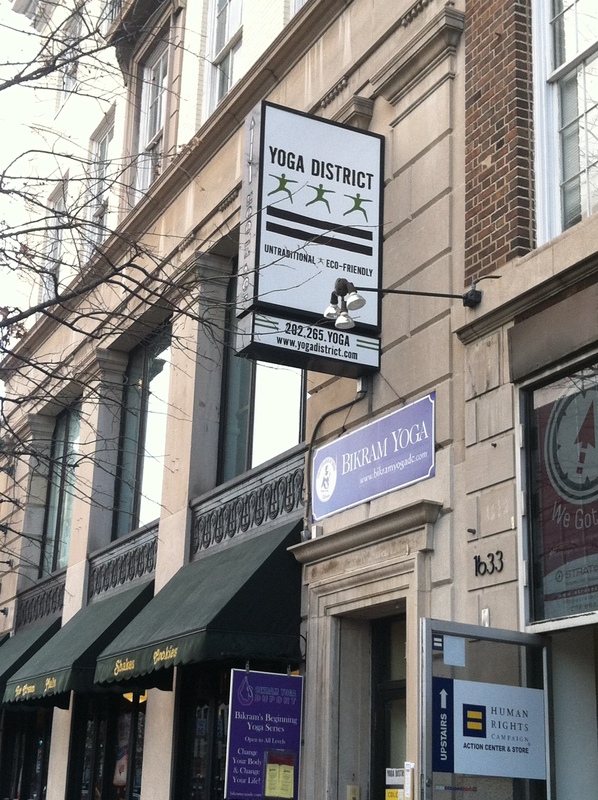 The Details: I recently tried two yoga classes at Yoga District. They have five studios around the DC area and are by FAR the least expensive studio I have yet to find for a single class. Drop in class rates are $10. I purchased a the New Student Special 2-Class 1-Week pass for $10. They also offer a monthly membership for $77 per month or a 10-class pass for $90. Since I purchased the two-class option, I attended one class at the Dupont Circle studio (Wednesday 6:35 pm Yoga 2 with Michelle) and a second at the I street studio (Monday 6:15 pm Yoga 1.5-3 with Audrey). The Good: The staff at both studios were really friendly. The gift at Dupont knew it was my first time and made sure to show me where to put my stuff, get water, rent mats or towels if necessary, etc. I’m usually pretty shy about saying I’m new so I like when studios have it in their computer systems and just take the initiative. Both practice spaces were really great. They had a very organic feel to them. Some might prefer a perfectly symmetrical space with no obstructions and clean deco,r but I think there is something really “yoga” about practicing in an attic with slanted ceilings or an oddly shaped room. It takes the regimented nature of exercise out of the class and makes you feel very free. As far as the yoga, I liked that both classes offered free time to work on inversions. Unlike other studios, we didn’t go to the wall, so they were really counting on you knowing your limits. I ended up holding forearm balance in free space for longer than I ever have! Of course the second class, I tried to do the same thing and ended up going all the way over into forearm wheel but that’s ok. I had the space and it was a good learning experience. My first class (yoga 2) also worked on eka pada koundinyasana which is one of my favorites. I definitely like the yoga 2 class much better. I liked the philosophy and feel better. To be fair though, my second class (yoga 1.5 – 3) did a variation of Shiva Rea’s fire practice (which is marked by 9 rounds of 12 push ups or 108 push ups in total). Something about that particular practice just doesn’t jive for me. It’s hard sure, but not in the good yoga way. I can do 108 push ups with my trainer, I’m looking for something different in yoga so I didn’t love that. The Could Be Better: Both spaces are a little cramped as far as waiting to go into class. I haven’t been to a single studio where this isn’t a problem though. The time between classes is always short so people are lined up waiting in tight spaces while people are trying to come out of class. This was more of an issue at the I street studio tho. Even the practice space was kind of a mess at times. The cubbies for your stuff is right near the door to the bathroom so people get hit with the door or get stuck inside the bathroom. It could be laid out better, but I recognize there are space limits. The class scaling system is my biggest issue. I just think it’s really arbitrary and doesn’t offer a ton of guidance for someone picking a class. I would tell you from my experience that the yoga 2 class was more advanced than the 1.5 – 3 class. I was expecting the 1.5 – 3 class to be offering many more advanced options (hence the 3?) but that wasn’t my experience. As mentioned above, the only thing that was “hard” was the 108 push ups, but that’s just because that is a ton of push ups, not because it involved advanced yoga postures. The schedule is also just really complicated. The different class descriptions, level variations… it’s just not very clear. I think if they cleaned that up a little bit and made class levels / descriptions more streamlined, it would be easier to navigate. – Do you have a studio “home” or do you bounce around? – What do you look for in a yoga studio? What’s your biggest pet peeve at a studio? Thanks for the shout out – I loved your review! I’ve been to Yoga District and really enjoyed it, but they declined my request to take photos of the space so I don’t have much to share on my site (boo!). Keep the reviews coming, I can’t wait to share them, and hope we run into each other sometime soon! If you like Thai Massage, I just took Mike’s Thai and Fly class last night on 14th. So yummy! I love that they offer more than just straight up yoga classes! I’ve been to the 14th st. yoga district a few times and really liked it. cozy studio — and like you said, can get a bit cramped at times. but overall found it a nice little community. probably in the top 5 DC studios i’ve tried so far! thanks for sharing your review! I was snooping around The Studio DC website and they have student rates, which is awesome….do you recommend I do it?